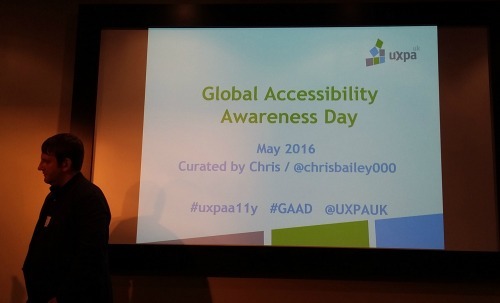 Having spent the day at Atos for their Global Accessibility Awareness Day event, I then travelled across London to the Daily Mail for the UXPA event on the same subject. I had already had a fantastic and inspiring day and UXPA continued the theme with four more great speakers. First up was Chris Kaminsky from Tobias & Tobias talking about a project his team worked on at Beatrice Tate School. This is a school for children with learning difficulties which span a really wide scale of abilities. He had three lessons which he suggests would work for any project. Lesson 1 - meet the people you are designing for. In this case they held multiple sessions with the children, where the children came to their office and the designers went to the school. Lesson 2 - Fix the obvious barriers. They found that the software the children were trying to use was, amongst other things, very slow. By creating something similar but faster they made it so much easier for the children to use. Lesson 3 - Focus on the abilities, not the disabilities. This is such an important lesson. Thinking about 'can' rather than 'can not', can make such a difference to a project and the people involved. This approach must have worked as they got asked back again to create a reporting system for the teachers, where they used the exact same lessons again. Chris finished by reminding us that there is no such thing as a normal person, just people. Next up was Katherine Payne from Wayfindr. This was a project between RLSB, ustwo, Google.org and TfL. The idea was to create an app for smart phones which would be able to direct visually impaired people round the London tube system using beacons set in strategic places. The phone would then be able to tell the user what was coming up, for instance steps or ticket barriers. I have been aware of this project for a while now and think it is an amazing idea. However they now want to take it further so that it could be used across many other environments for instance shopping centres or hospitals. To do this, as they are only a small team, they have focused on creating an Open Standard so that people can expect the same service across the world. Once you start thinking about it in this way it also changes who might use it, for instance it could help people with autism who have an issue with sensory overload, or people travelling in other countries who can not read the language or even the small percentage of adults who struggle with reading. The third speaker was Dr Gabriella Spinelli, from Brunel University, who spoke about designing for the self in transition. Gabriella's research looks at how we interact with technology as we get older and the coping strategies which people have. We are all getting older, whether we like it or not, and this means that this will become a problem for all of us at some point. As we get older we become more defined, so we are less likely to switch between products - we know what we like and what works. We look for things we are familiar with and change our environment to fit us. She showed us photos from peoples homes where she had done research, showing passwords stuck in full view on walls, and computers covered with lace to hide their coldness. Interestingly many computers had also been placed on wooden surfaces as a way of controlling them (this was mainly in Japan). It is really important that we do design for our older selves while being careful not to perpetuate the accessibility problem. The last speaker was Gareth Ford-Williams, from the BBC, whose super talk I had seen earlier that day at the Atos event. A great event to finish off a brilliant day, leaving me with much to think about and feeling very inspired.